Explore the amazing world of machines! You’ll be amazed at the similarities between the rarely-displayed machines from our priceless collection and the machines you use every day! While some machines serve practical purposes, others are entirely whimsical. A highlight of this exhibit is the Maillardet Automaton—a truly amazing machine that inspired the award-winning children’s book The Invention of Hugo Cabret and film Hugo. Examine the fascinating inner workings of common household items like a vacuum cleaner or drill. “Exploded” views of these everyday machines provide interior views that vividly demonstrate how simple components can power complex mechanisms. 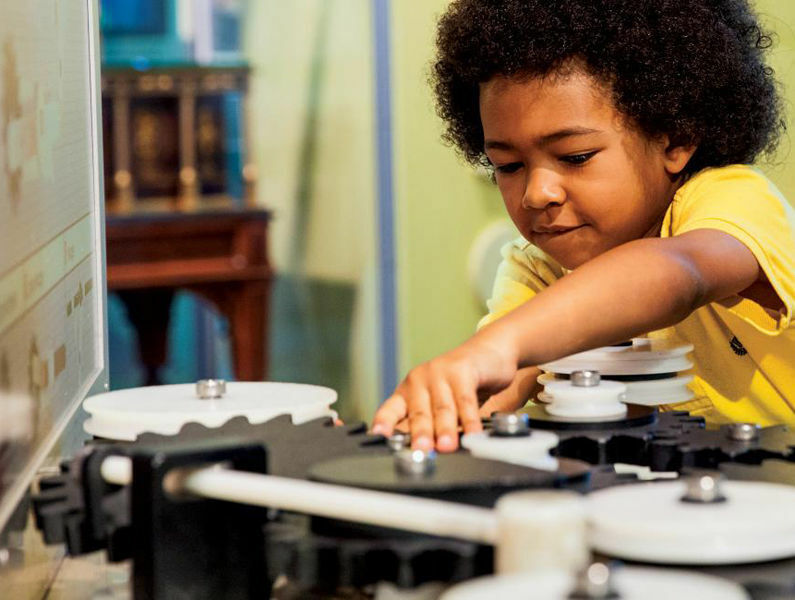 Test your engineering skills and use gears, linkages, cams, and pulleys to create your own new machine. Discover how each component effects the design and function of the entire device. Try your hand as a crane operator and move blocks from one target to another. Here’s a hint: You’ll have to master power and control to move the crane and complete the job!